Bentofix® GCL with nonwoven cover geotextile and woven carrier geotextile. An additional surface polyethylene (PE) coating is applied in a liquid state and then allowed to solidify on the carrier geotextile. The additional bonding of a PE coating to the needle-punched, fibre reinforcement is permanently locked and increases the pull-out resistance as well as the internal shear strength. The mass coating is 500gsm (0.5mm thick) minimum and upto 1000gsm (1.0mm thick) for the friction coating and exceeds the GRI-GCL3 (USA) minimum specification requirements for coated GCLs. Also features self-sealing side overlaps. The coated (friction), Xf-type GCL is used predominantly in the following applications: an immediate barrier against Radon gas; desiccation protection; small root penetration protection; bentonite erosion at high water heads and underlying coarse subgrades; or for secondary containment (providing eXtra safety factor) against hazardous liquids. 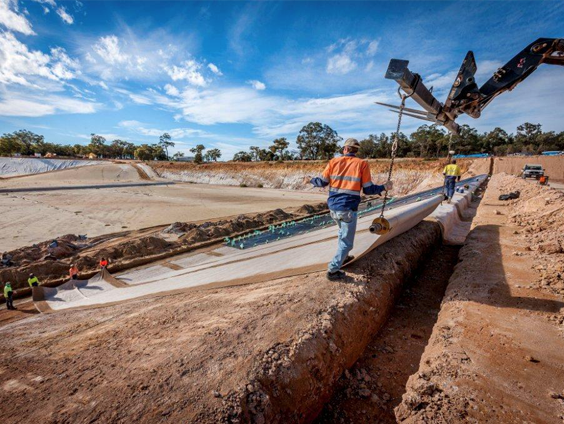 The other added benefit of a friction coating is the increased interface friction value, allowing for steeper side batters, but providing significant protection against internal bentonite erosion and piping for exposed multi-lined landfill cells. Shrinkage reduction from environmental/thermal changes is also an important advantage. 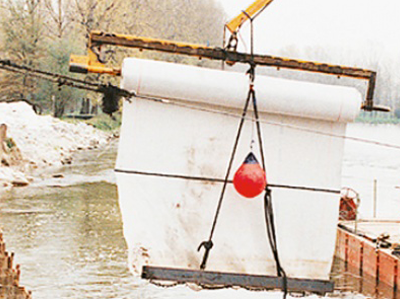 After the first pilot project installation of a geosynthetic clay liner (GCL) in a 1 km long section of the Havel-Oder-Waterway in 1997/98, approved by the local German Water and Ship Authority a second project followed shortly after.